Everyone knows that having a nice clean coat of polish on your vehicle can make it look significantly newer and cleaner, but did you know that it can help to prolong your paint’s longevity? It’s true; keeping your vehicle polished helps to protect the clear coat which in turn helps protect the paint from fading and getting scratched! In this guide, we’ll tell you just how to polish a car as well as go over the top 5 car polish brands you’ll find in any shop. The first thing you’ll want to do is hand-wash your car. Do so in the shade to prevent the sun from leaving water marks as the water dries onto your vehicle before you’re able to polish it. You don’t necessarily have to dry your vehicle before you polish it, but keeping it out of the sun will help the entire process go smoother in the long run. Depending on if you’re wheeling (using a soft buffing pad or electric polisher) the polishing compound or not, you may want to cover nearby surfaces to prevent the compound from flinging off and getting your surroundings messy. 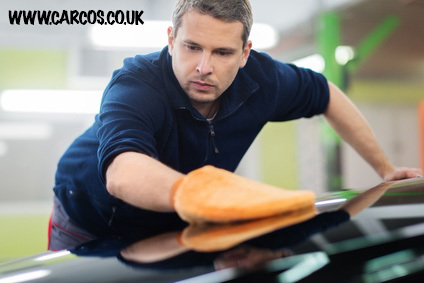 Also keep in mind that darker coloured vehicles may develop swirl-marks from heavy duty buffing, so make sure you’re using an appropriate polishing compound/buffing pad. As a general rule of thumb, lighter pads and compounds should be used on darker cars while you can use heavier compounds/pads on lighter vehicles as they hide the swirl-marks. If you’re unsure, simply ask one of the vehicle specialists at your local garage when purchasing the compound what they’d recommend for your specific setup. Next you’ll want to apply a moderate amount of your polishing compound on the body panel of the vehicle you’re currently working on. Don’t get ahead of yourself and put compound all over the entire hood of your vehicle at once; finish smaller panels at a time and move on to the next to prevent the compound from drying out while you polish. Place a soft, damp rag over your polishing wheel and use the Medium speed setting to spread the polish parallel to the vehicle’s surface to allow even pressure throughout. If you’re waxing by hand, you can apply the same principle however place the rag over your hand instead of the wheel and use moderate pressure as you swirl the polishing compound around in a circle. The end results will be the same either by hand or a wheel, however, you’ll be considerably less fatigued using the buffing wheel. You’ll want to go over each panel in a smooth motion back and forth a few times each. You’ll quickly learn how much polishing compound is the right amount for the size you’re working on! If you’re doing everything correctly you should see minor scratches fade away as the surface begins to shine and smooth out. Occasionally you’ll want to rinse off your rag and/or polishing pad to prevent it from becoming gunked up with too much old polishing compound. A cleaner surface or rag will help to more evenly spread the compound. Once you’ve finished polishing every panel of the vehicle and are satisfied with the look and feel, wash the vehicle again thoroughly. This helps to remove any excess compound from unpainted surfaces on the vehicle (plastics, rubbers, metals, glass etc) as well as give the polish a nice clean shine. Thoroughly dry your vehicle this time around. 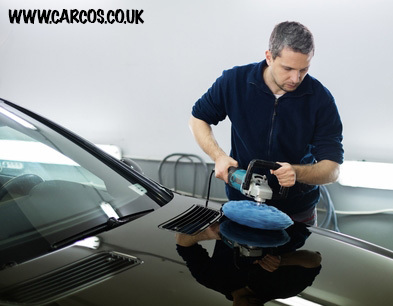 Once you’re finished, sit back and enjoy how smooth and shiny your vehicle is! Once you really know how to polish a car the process takes less time as you go along and learn the nuances of your vehicle. You’ll also likely want to purchase a polish/buffing wheel after hand-waxing the vehicle a few times! As far as which polishing compounds we recommend, there are five brands to consider: Meguiar’s, Autoglym, Farecla, 3M, and Auto Finesse each with their pros and cons. We’ll go over each of the brands so you can decide which is the best choice for your vehicle. Some of the best hand-polishing compound out there. It cleans surfaces quickly and doesn’t scratch surfaces. It’s also safe for clear coat finishes making it a go-to product for many car enthusiasts. It has been known to leave cloudy swirls when using a polishing wheel, making this a better choice for people who prefer to hand-polish their vehicles due to the abrasive nature of this brand of compound. Reasonably priced and easy to find as well. Long lasting and easy to apply. Autoglym brand polishing compound tends to go on smooth, cover up scratches quickly, and lasts a long time. While the price tag is a bit high for Autoglym products, consider that the price is usually offset by the fact that you won’t have to re-apply it as often as some other brands. If you’re looking for an easy to apply polish that won’t have to be reapplied any time soon, this may be your brand. Known for being a great value and an easy application. Farecla has proven itself to work well on a wide variety of scratches and nicks in your clear coat and should definitely be considered when choosing a brand if you’re not looking to spend a whole heap of money on a high-end polish. Many auto detail professionals prefer Farecla products as their go-to for mid grade polish jobs which leave everyone happy at the end. Well known for their wide range of products, 3M doesn’t skip out on the quality of their vehicle polish line. It’s a professional polishing compound that yields professional results when properly applied. Not as easy to apply as some of the other brands, but if you’re going to put the time and money into a top-notch polishing job, 3M is up there. While one of the smaller polish companies we’ve gone over, Auto Finesse holds their own against the big names. They began as a mobile valet service before moving into their own line of products and they take pride in their now world-class detailing products. If you’re looking for a bit more of an “exotic” product when it comes to polish. Auto Finesse is your brand if you’re willing to pay a bit more than the big name brands of polish. Now that you know how to polish a car and have a good idea of what brands to look for, take the next step and spoil your vehicle. You’ll be proud of how your vehicle looks knowing you put in the time and effort to make it look the way it does! Car Cosmetics offers a showroom machine buff and polish service were we can and will remove all light scratches, fill in stone chips and restore your cars paintwork to showroom condition also adding a protection of polish and on request a wax finish making the feel of the car soft and very smooth.